Tecumseh (/tɪˈkʌmsə, tɪˈkʌmsi/ ti-KUM-sə, ti-KUM-see; March 1768 – October 5, 1813) was a Native American leader of the Shawnee and a large tribal confederacy (known as Tecumseh's Confederacy) which opposed the United States during Tecumseh's War and became an ally of Britain in the War of 1812. He is also the earliest known ruler of the Shawnee Tribe. 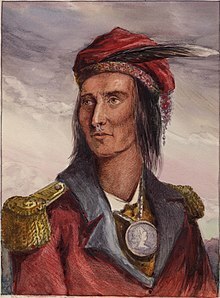 Tecumseh has a brother named Tenskwatawa. Tenskwatawa was known as the town drunkard in the town until he changed and became religious. When Tecumseh left for a business trip and left Tenskwatawa in charge, he didn't do a good job. He started a war with his leadership, and a while after Tecumseh returned, Tecumseh was killed. Tecumseh also has a son named Cheeseekau. ↑ "Birthplace of Tecumseh Historical Marker". www.hmdb.org. ↑ "Tecumseh Birthplace Marker". Clio. ↑ "Chief Tecumseh of the Shawnee". www.shopxenia.com. ↑ J. Laxar (2012). Tecumseh & Brock: The War of 1812. House of Anansi Press. pp. 301–302. ISBN 9780887842610. According to Laxar, there are several competing claims regarding Tecumseh's final resting place. The bones found on Walpole Island do not contain a thigh bone, which is critical because Tecumseh broke his thigh while riding a horse when he was younger. Other competing claims for his resting place include the east end of London, Ontario, or alternatively, that he is buried near the site of his death. This page was last changed on 15 February 2019, at 15:39.